On this article you will find more than 7 balance bike reviews that are readily available for the this summer season. Also, as you will see below we have provided you with a unique comparison table that looks at the top features for each bike. This section is dedicated to brief balance bike reviews consisting of our top choices. To see our detailed overview for each, please click on the links below. Our first of many balance bike reviews looks at the Diggin Active Skuut. It is designed and built with the environment in mind – its frame and fork are made out of one hundred percent birch wood and lacquer veneer finish; it uses non-toxic paints and glue. Some of its features include: a steering limiter, spoke-less wheels, 12-inch pneumatic rubber pressurized tires. With an adjustable seat ranging between 13 inches and 17 inches, and a maximum weight capacity of 72 pounds, the Diggin Active Skuut is best suited for children ages 2 to 5 years old. This award-winning bike was one of the first introduced in the United States. Although the Diggin Active Skuut’s eco-friendly materials makes it ideal for environmentally conscious parents, when compared to others available in the market, the Skuut is simply average. The drawbacks of the Diggin Active Skuut are, ironically, the same things that make it a decent bike. It’s birch wood material, although eco-friendly, is not marine-grade (not weather, or water, proof). As a result, the wood is susceptible to warping and rot. It offers little flexibility to the rider – limited adjustability and adaptability. 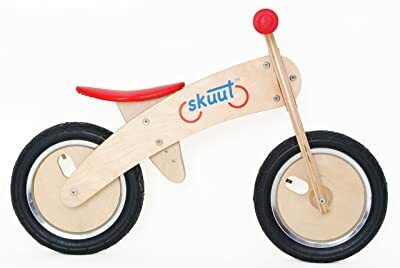 The Skuut’s price ranges between 70 dollars and 100 dollars. The Early Rider Lite is one of the more expensive among its wooden competitors and is the second we look at in our balance bike reviews list. With an overall weight of 7 pounds and a maximum carrying capacity of 125 pounds, the Eearly Rider Lite is ideal for children as young as twenty months, and as old as five years old. It is constructed of out of wood, but it uses a Forest Stewardship Council (FSC) Certified birch wood. Consumers are assured that the wood was extracted using environmentally friendly methods. Furthermore, unlike most of its competitors, the Early Rider Lite uses wood that is weather and water proof. Its other popular features include: Adjustable seat height ranging between 11.6 inches and 15 inches, an adjustable handlebar with a 2-inch laminate riser, steering limiter that can be removed if not needed, 12-inch pneumatic rubber tires, non-toxic materials, and recessed bolts. The Early Rider Lite has a few drawbacks, one of which is price (a hefty investment of $160 dollars at the most); the other is the absence of footrests, or brakes. The Early Rider Lite does not give the consumer the option of adding either feature (brake, or footrest). Nevertheless, it is built with quality, and the environment in mind. The FirstBIKE is one of five models available. It is one of the more versatile available in the market, offering the rider a variety of options. With its high quality design and materials, the FirstBIKE Street is the top model offered by FirstBike that parents can expect to pass on from one child to the next. It comes at the hefty price of 160 dollars, but many feel it is the best out there. Its feature list looks as follows: a flexible and lightweight frame (8.4 pounds) made of injection-molded composite – as a result the frame is better at absorbing shock; a hand-controller rear drum Safety Stop™ brake that gently applies braking power rather than suddenly – the brake’s power is also adjustable; its pneumatic tires are replaceable, so parents can opt to purchase the Schwalbe Big Apple tires separately; an optional lowering kit that lowers the bike to a minimum of 11 inches; a lifetime warranty on the frame and fork; a five year warranty on all other parts; and, it is equipped with a steering limiter. With its lightweight frame, the FirstBIKE Street is easy for children as young as 22 months old. Yet it is also suitable for children up to five years old since many of the bike’s features are adjustable. Due to the FirstBIKE Street’s expensive price tag, it is more of an investment. It might be more suitable for the serious biker, or the multi-children family. The FirstBIKE Street’s high quality materials ensures it will outlast the abuse received from its various riders. One of the top balance bike reviews belongs to the Kazam. The KaZam Balance Bike has gained added popularity after appearing on the television show Shark Tank. 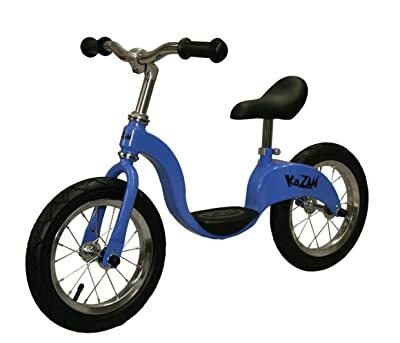 Weighing in at 11.2 pounds, the KaZam is one of the more heavy bikes among its competitors, therefore, its designers targets the 3 to 6 year old age group. The KaZam’s distinctive feature is its patented footrest – many of its competitors do not come standard with it, or offer it as an add-on (purchased separately). The footrest is incorporated into the frame, perfectly placed at the center of the base where the rider’s feet is at a natural position. Aside from the footrest, the KaZam’s features include: 12-inch pneumatic rubber tires; metal spoke wheels with ball bearings; smooth tread pattern on the tires for a smooth ride, covered bolts, adjustable seat height with a minimum of 14 inches and a maximum height of 17.5 inches; adjustable handlebars that lower to 19.75 inches; quick release clamps on the seat; an option to purchase the model with brakes; and, a maximum weight capacity of 75 pounds. The KaZam’s patented footrest is the main highlight; however, the option of purchasing it with, or without, brakes shows how the company is sensitive to its consumers’ feedback (originally, the bike came without brakes). It is not ideal for little children due to its heavy weight. The Prince Lionheart is almost similar to two other eco-friendly wooden bikes in the market – The Diggin Active Skuut and the Smart Gear. Similarly, the Prince Lionheart uses a birch wood frame that contributes to its lightweight of 10 pounds and capable of carrying a maximum weight of 65 pounds. Its target group is the 2 to 5 year old range. The Prince Lionheart’s includes: birch wood frame finished with lacquer veneer; non-toxic materials; an adjustable seat post offering four different height positions; and one-size fits all saddle and hand grips. 12-inch pneumatic tires; and metal spoked wheels. The Prince Lionheart is manufactured by a family-owned and operated business (Prince Lionheart), who takes pride in crafting reusable and high quality products. Coming in at 100 dollars, the Prince Lionheart is one of the simpler designed bikes in our list but does not offer much in terms of adjustability, or adaptability. It use of reusable and non-toxic materials make it an eco-friendly, and safe option for environmentally conscious parents. Improper care, or maintenance to its frame can eventually cause it to warp, or rot. Its charm, however, comes from its company’s humble beginnings. The name Radio Flyer is synonymous with classic America – known for its little red wagon and tricycles. The company’s Glide and Go carries the same red color trademark. 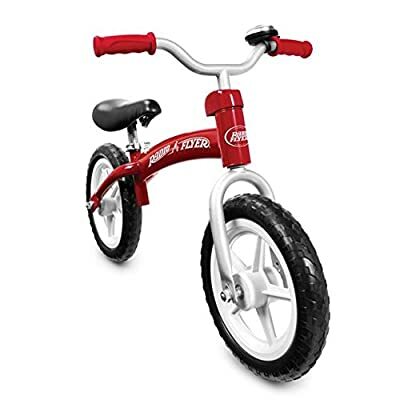 At an attractive price ranging from 40 to 60 dollars, the Radio Flyer Glide and Go serves its purpose as a standard bike – does not offer the consumer anything fancy in regards to accessories. It is recommended for ages 2 ½ to 5 years old as its maximum carrying capacity is 49 pounds. Its main features include: steel-framed that gives it an overall weight of 9 pounds; 12-inch non-inflatable, puncture-free foam tires; five spoke wheels; adjustable seat with a minimum height of 14 inches and a maximum height of 18 inches; quick release clamps; a ringing bell as an added touch of classic America. The Prince Lionheart is not equipped with footrests or brakes. The price of the Radio Flyer Glide and Go makes it an ideal choice for parents who are looking for a simple and straightforward bike. Its tall height and heavier weight does not make it ideal for children below the age of two. Although it may not be as fancy as some of its other competitors – ones that offer the rider more flexibility, and capable of withstanding tricks executed by more experienced riders – the Prince Lionheart is, arguably, a more durable option that most wooden models. The Smart Gear Classic is one of the several options offered by U.S. toy manufacturer, Smart Gear Toys. 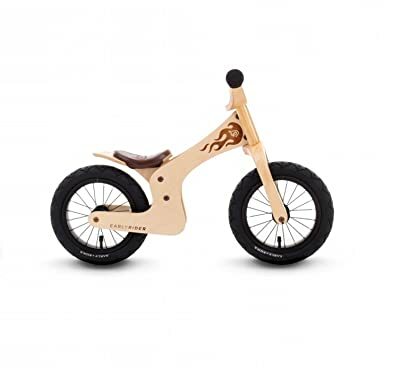 As an advocate of using eco-friendly products, Smart Gear Toys created their bikes with the renewable and reusable birch wood. Its main features include: non-marine-grade birch wood frame and fork that contributes to the overall 11 pound weight, finished with lacquer veneer; non-toxic paints and materials; steering limiter; a carry handle incorporated into the design for easy carry, spoke less tires; air inflatable tires; adjustable seat height ranging from 11 inches to 17 inches; and rubberised handle grips. The Smart Gear Classic is intended for children ages 2 to 5 years old. Its maximum carrying capacity is 65 pounds. It does not offer consumers a variety of add-on accessories, neither is it adaptable to the growing needs of the rider – no footrests or brakes available. Due to its non-marine grade birch wood frame, and non-rustproof bolts, the Smart Gear Classic bikes’ durability rates low ; but, such drawbacks are not different from other wooden bikes with non-weatherproof frames and forks. It does score points for being environmentally-conscious. 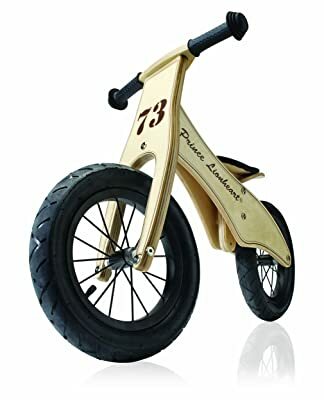 Balance bike is the best option to make your child feel good at a two wheel vehicle without excess hours spent on attempts to teach balancing with a pedal bike with or without training wheels. If you opt for a bike with training wheels, your kid would get used to them and removing them will pose a stress, which would take them much time to overcome. With a balance bike there is no such stress – the child will go straightforward into examining the bike-s capabilities, and since there’s no training wheels they will start trying to achieve balance from the very beginning of its use. Children develop feelings for their toys, and if you get them a tricycle, they will fall in love with it, but what are they going to learn with it? A tricycle will definitely support their activity, but you should forget about balance. One day you take them their loved trike and give them a true pedal bike they will resist change and do everything to avoid using it – demanding the trike back! Another very important advantage of balance bikes is ease of transport. They can be brought even in hand, and when taking long distances it can get into the smallest subcompact, as it doesn’t feature pedals nor a bulky design like a trike. What about parents? Balance bikes require increased involvement of parents when compared to training wheel bikes or trikes. It would mean your greater activity and an even closer relationship with your child as you will spend more time together. Balance bikes get more fun as you would enjoy your child’s every step to mastering balance. Still think that balance bikes are waste of money? A balance bike replaces both a tricycle and a 12-inch pedal bike. A small pedal bike lacks comfort due to small distance between the upper pedal position and the seat, even at the highest seat position. Thus, a 12 inch pedal bike which is bulkier and pricier will quickly get outgrown, possibly even before your child mastered pedaling. With a balance bike, your kid will look for thrill and thus gain confidence quicker. It’s almost certain that balance bike will benefit your kid. And if you opt for a durable model, once your kid masters balance and steering, you will be able to resell it at a still good price at a garage sale. Most of us before learned balancing on a bike with training wheels, and some of us still remember how hard it was to drive it the first time with training wheels raised or removed. If you get your girl or boy a balance bike, she or he wouldn’t have any opportunity to rely on such as a third or fourth wheel, and will be forced to go straight to learning. Choosing the right balance bike for your child is more important than you may think. The fact that all balance bike manufacturers need to comply to very strict regulations regarding safety, it doesn’t mean that every bike would fit every child. In fact, you should choose wrong size, length, or any other feature that your kid can perceive as lack of comfort. Children often won’t complain about poor fits, no matter how they actually feel. The first thing to take in account is the age and size of your child or children. Note that size of every child is not the same, and there are no universal sizes for an age. Preschoolers grow faster, so if your kid is one you better buy a balance bike with a good seat and handlebar adjustment range. The next very important thing is the inseam length of your child – from floor to crotch. If you too ride a bike you probably know its importance when buying a bike for yourself. The average seam of an 18 months old is 11 inch, and for those 24 months old it goes to 12″ and when turning 3 average seam length is 13.5″. However, you should best measure it on your own and see what seat height adjustment levels various balance bikes can offer to your child. The lowest point in balance bikes can be anywhere between 11″ and 15″. Some companies release models for toddlers along with those for preschoolers. Ability and readiness of your child also plays a significant role. If he or she lacks any bike experience and is unwilling to ride, it’s the best to take them some light bike without much features. Your child would thus focus on what balance bikes are made for. 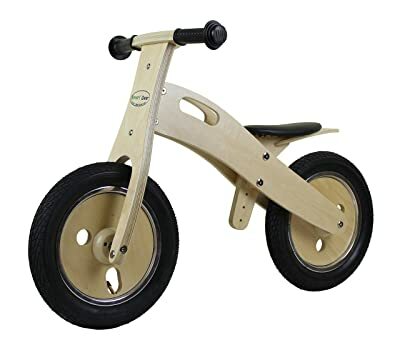 It may be a wooden or a light steel made model, although some manufacturers now have balance bikes with alloy and even composite frames for parents ready to pay some more for it. Balance bikes made of steel are dominant, since they offer durability, seat and often handlebar adjustability, and a fair price. Wooden bikes may still be good for those who think raising an environmentally aware child is highly important. However, some preferences are actually those of the parent – not of the child, and not following any honest recommendations. Remember that you buy this bike for your child and his good, not for yourself and your perception of what MAY be good for her or him. Many parents fall into that trap. Balance bikes are intended to make your child happy and satisfied. When this is achieved learning balance and coordination will almost certainly be easy and successful. There are two types of tires – flat-free foam tires and inflatable or air tires. While foam tires are certainly flat-free, air ones are more durable and less susceptible to damage. These tires also offer better comfort and better steering. There are three major types of wheels. Spokes (as in most bicycles), plastic and wooden. Spoke ones are the most durable and most comfortable, while wooden wheels can only be found in wooden balance bikes. Plasttic wheels are lighter, but also less durable when compared with spoke wheels. Latest designs feature comfy, soft saddles, though it applies only to metal bikes. Wooden bikes still feature very basic plastic saddle with few adjustment positions (if any at all). If you consider saddle comfort as essential you should opt-out wooden bikes. Handlebars don’t just offer comfort, they have an important safety role, too. 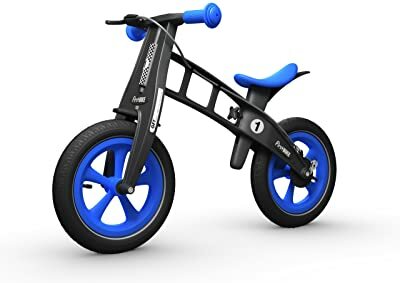 Rubber grips on latest balance bikes usually have knobby ends which protect your child when falls from the bike and when has a collision with tree, wall or any other object on its way. Your child needs to always have his helmet on when riding. Think of it that every child is always likely to fall, even if they’re riding with confidence. Not to count many dangerous situations all children often fall into. Also important are shoes, it would be sneakers, tennis shoes or closed sandals. Always be with your child, especially if it’s riding on potentially dangerous places like driveway, when it can easily ride to the street. Well there you have it. We hope this article helps you in deciding what the best balance bike is for you and your child. All models shown above have their distinctive pros and cons, and which one to pick depends on what you expect. Whichever choice you make, you should know that balance bike is clearly the best for your toddler or preschooler to acquire basic motor skills.